"Horses can read a person and be sensitive to a person’s fears and feelings"
"A horses temperament can match that of a human, offering either a calming effect or a stimulating effect"
"Equine Assisted Therapy (EAT) is quite simply the use horses to “assist” in the therapy of humans"
Is Equine Assisted Therapy safe? Equine Assisted Therapy (or EAT for short) has one purpose; to provide horsemanship experiences to persons with mental health, physical and psychological disabilities in order to enhance the quality and productivity of their lives, by stimulating the senses and awakening emotions. 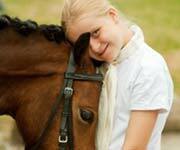 A horses temperament can match that of a human, offering either a calming effect or a stimulating effect. At Equine Connection here in Wexford, such gentle interaction can increase self esteem and form a wonderful bond in individuals where human relationships have previously been inadequate. Equine Assisted Therapy (EAT), also known as Equine Assisted Learning (EAL), is a gentle system that allows groups or individuals to "interact" with horses in a safe and calm environment. The client or group never mount the horse, but get involved in very carefully chosen ground-based activities, that allow the client firstly get used to the horses temperament, then to work with the horse on simple tasks like leading the horse. At all times our highly skilled equestrian expert, Martina Doran, will supervise these slow-paced sessions. 2016 All Rights Reserved. © Equine Connection. Duncormick, Co. Wexford, Ireland. Tel 051 563487.